Exclusively ours, Rhode Island 101 is designed to assist with deciphering the unique “Rhode Islandese” dialect spoken everywhere from Charlestown to Chepachet. This 5x7 hanging metal sign is a quick reference to basic words and phrases essential to navigating Lil’ Rhody. 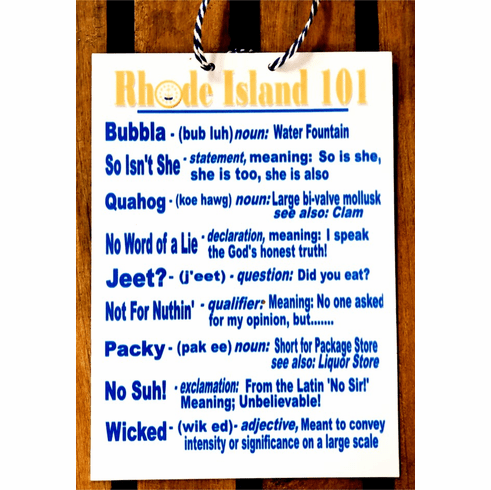 From Bubblah and Quahog, to No Suh!, you’ll be speaking Rhode Islandese like a pro. And you’ll be able to prove to the uninitiated that you’re really not making this all up - No word of a lie!